KozaK Auto DryWash Cloths have been a staple in the auto care industry since 1926. More and more motorcycle owners are now discovering the safe, effective cleaning of the Kozak Motorycle DryWash Cloth. KozaK DryWash Cloths were invented out of simple necessity – to cut out the expense of the car wash. And they work too. The DryWash Cloths save 80% of the wet-washing expense; both in time and materials, and it was discovered that the cloths were extremely durable, further enhancing their cost-effectiveness. Each cloth could easily withstand up to 50 cleanings. Countless motorcycle owners have discovered the time-saving benefits of the Kozak Motorcycle DryWash Cloth! It’s quick, it’s easy, and the results are plain to see – Kozak works! So what is a Kozak? KozaK Motorcycle DryWash Cloths are specially constructed and chemically treated. The fabric is 100% cotton of the finest domestic blend – still one of the world’s softest materials. And only KozaK Motorcycle DryWash Cloths have a double-sided, deep, plush napped finish. The exclusive KozaK formula is then infused within the fabric, which makes the cloth clean like a vacuum – pulling dust, dirt, and contaminants up and away from the surface, and seizing it within the weave. Though they were created for cars, the KozaK Motorcycle DryWash Cloths are ideal for quickly cleaning motorcycles when you’re out on tour and don’t have time for a complete wash and wax. KozaK Motorcycle DryWash Cloths are completely non-abrasive and the process is safe to use on all finishes and metal- even chrome! And the KozaK formula is safe as well – it won’t harm the environment or your skin! Use KozaK Motorcycle DryWash Cloths on every area of your bike except for windshields. Everywhere else – go for it – the only thing you’ll see is your own reflection smiling back at you as you admire the deep shine you’ll achieve with KozaK! 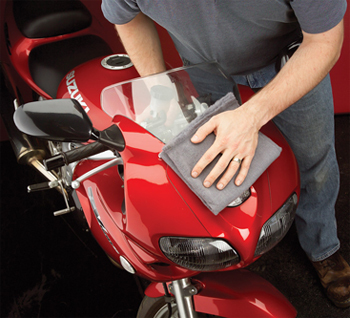 The Kozak Motorycle DryWash Cloth is safe on all metal and painted motorcycle surfaces. Conserve water and time – use KozaK Motorcycle DryWash Cloths between ‘wet washing’ to keep your motorcycle looking newly detailed every day! The usefulness of some things diminish with time – but KozaK Dry Wash Cloths just get more popular with age. For nearly 80 years KozaK has been keeping vehicles looking pampered and new – it can do the same for your motorcycle! It’s simple to use KozaK Motorcycle DryWash Cloths. First, make sure the motorcycle is completely dry, to get the best results from the exclusive DryWash features. Keeping the DryWash Cloths folded like a thick pad (do not open up like a towel!) wipe lightly, in straight sweeps at first to remove the top layer of dust and dirt. Then refold and repeat... always making sure to knock the pad against your other hand to release the loose, heavier dirt from the napped fibers, leaving only insignificant particles which then act as a polishing agent –similar to the effect of a jewelers rouge. Thus the cleaning and polishing in one cloth – without ever wetting the bike! Have used these Kozak towels for the last 20 years and there is STILL no other product on the market that competes with this fine product!